and Need to Downsize Tons? And No One Wants to Buy your Hoopty 50’s Style Hill Billy Front Porch Picnic Table? You Fix it Up and Five it to a Young Adult for her First Apartment! Nor Were a Couple of the Legs! And Then I had to Figure out What to Put There? But Before that… I Painted all the Wood White. Oh Boy, I got Creative with the Trim! And Decided it Would Work Perfectly! The Drawer Even Got Purdied-Up! It is So Cute, it is Making the Hill Billy Front Porch Look even More Hoopty! You Forgot about the Legs! Although I just painted them, you could use a wood putty to re-shape them. When I Have More Time and Less to Do. To See More Purdy Things, Please Go to: OUR OWN BIG WORLD! Or Books on Our Shelves. 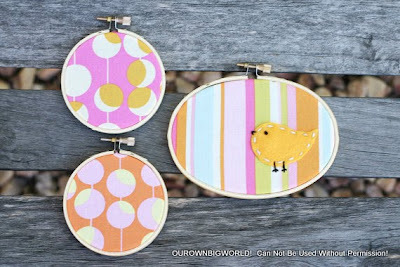 From Craft Ideas From PR! This Book Cover Art Works for Me! 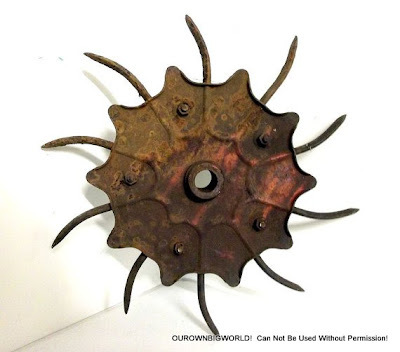 Would Match This Cool Industrial Wheel Folk Art Rather Well! And how about Blossoms that Bloom all year-long? Rusted Railroad Screw Spikes and Up-cycled Vintage Brass Curtain Tie-backs make an Awesome Bouquet! 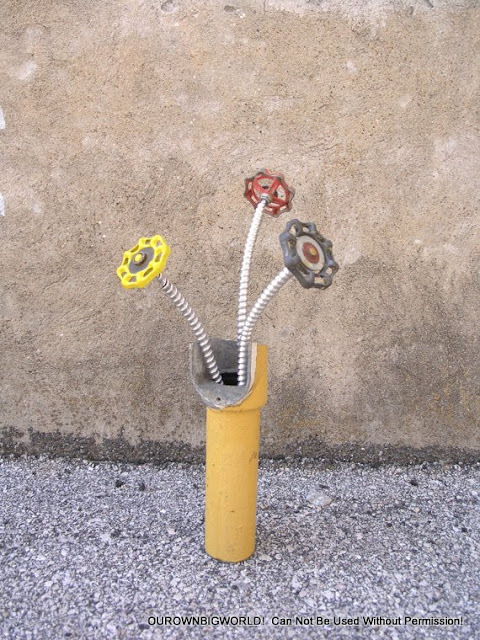 How about this Bundle of Fun up-cycled colored metal! How about a mini croquet set to snazz things up a bit? Vintage Sporting Goods and Color? The options are limitless! 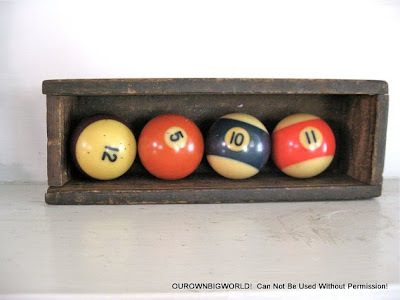 Fun old pool balls in a cool old box! 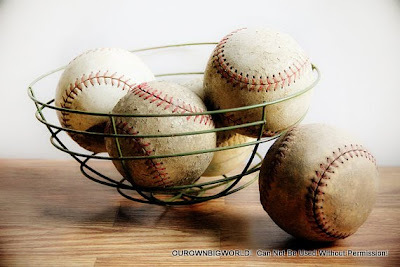 Love the feel and look of an old baseball, and a basket of them is even better! Like an old tool box, or even better, a vintage Votive Candle Mold Folk Wall Art! Pots, Pans, Strainers…are all cool wall art! Let’s saunter away from metal. Let’s linger around another cool idea! The re-use of a useful item of days gone by for decor! It will look Oh-So-Loverly in an Old Box of any kind! To finish up, let’s go circular! Vintage Chenille in Vintage Metal Needlepoint Hoops! And if you want curtains that are NOT curtains…. Then these are for you! OR A PIECE OF HISTORY ABOVE YOUR MANTEL! To see more of our UNUSUAL DECOR SUSPECTS go to OUR OWN BIG WORLD! Even on My First Ever Market Selling Day! It was a fun experience, even though I have to shed product for a move we will be making. But as always, we follow the husband’s work! Always exciting, always interesting, always an adventure…. No, The Husband Was Not Bored! It Got so Much Attention, and It Is Still Available! As Are These Weigh Cool Scales! And the Colors are Just Starting to Change! Favorite Customer of the Day! 93.5 year old reading up on how to make empanadas! And Put My Feet Up On a Cool Little Stool for Sale! And Enjoyed a Nice Day Outside and Together! If you see something you like in these photos please visit: OUR OWN BIG WORLD ! As it may not be up on the site yet! This project has history and of course, chatty me has to tell you about it! The huge white shelves on the right in the garage came with the house when we bought it. For some reason, the husband, had to tear them down and they were monsters! Mind you, there now are metal shelves exactly where these used to be? Don’t ask me! Anyway, they were monsters because each section is at least 7.5″ long and made of at least 1.5″ thick plywood, with little pieces of woods attached to both sides (to place shelves)! Can you say super heavy and awkward? What is worse, the husband would not let the contractor take them away! So my mind went to work! What could I do with these??? Aha! We did not have a bed frame! So, I decided I could use the Monsters for a Platform Bed Frame! The husband nixed this idea for almost a year! But I finally went forward with my design vision! And kept on painting! Those suckers are big, even if I did not have to paint the full sides! After painting, had to transport the monsters to the bedroom. Huff Puff, Ouch, Oooh, Wait, Okay, Got It! For some reason these monster garage shelves had trim on them, who puts trim on a garage shelf? I had to take some trim off (or shall I say, “The husband had to take the trim off), to use it for the end to make for a more finished look. I thought those funky little pieces of wood that stick out (which I like to call “nobbies”) would make the Monsters look cool as a Platform Bed Frame. And I was right! It does look cool! What I forgot is that we have a box spring! Which makes ours just, ha, a tad bit higher! But I still like it! There needs to be some tweaking on the end part that sticks out at the end. Tweaking, not to be confused with twerking (which by the way that area is perfect for dancing on top of, you know). Picture this…running through the house, sliding around the corner into the bedroom trying not to lose speed, continuing toward the bed stepping up with one foot up on that end part, giving just the right thrust to DIVE into the bed! Yes, we really are in our 40s! And ahem, we have both tested the diving board and my platform bed frame is that strong! But no, I am thinking a long thin bench style cushion for that area in complimentary colors would make for that nice low seating area I had in mind. Do you have any other ideas I could do with that area (maybe steps for our aging cat)?? If so send me some suggestions in the comment area please! Okay, I should have made sure the bed looked a bit better for these photos, but you get the point! PS…Even though the husband was not into this particular design idea, even with the nay saying, he kept on helping out! I now thank him for the trim removal, trim adding, monster lugging and block carrying help he did provide! We are kind of getting good at The GnoMAD PAD team projects! Click here to see our House Number Team Project: PROJECT FOR TWO! I make other things besides bed frames. 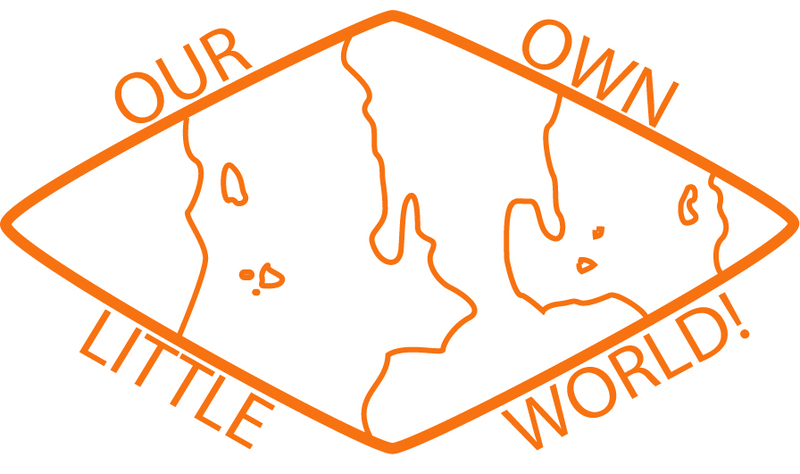 If you want to check them out, please visit OUR OWN BIG WORLD!